Last week, I was fortunate enough to visit the archaeological site of Augusta Raurica, the Roman town on the river Rhine at Augst (Switzerland). 2000 years ago, Roman army veterans and local Celts established a large town there. At that time Augusta Raurica was located on the edge of the Roman Empire on the border with Germania. Gradually, the neighbouring Germanic regions on the other side of the Rhine were also conquered. This meant that Augusta Raurica came to be in the hinterland, where it was protected from war and skirmishes, and blossomed into an important Roman town. The ruins at Augusta Raurica have been a popular tourist destination for hundreds of years. The Roman theatre is the best preserved ancient building in Augst. Three different theatre buildings replaced each other where the ruins of the theatre stand now. The remains that survive today were from the last construction. It was used between 180 and 280 AD, after which it served as a quarry and slowly fell into ruins. The theatre had three tiers and could seat 10,000 people. 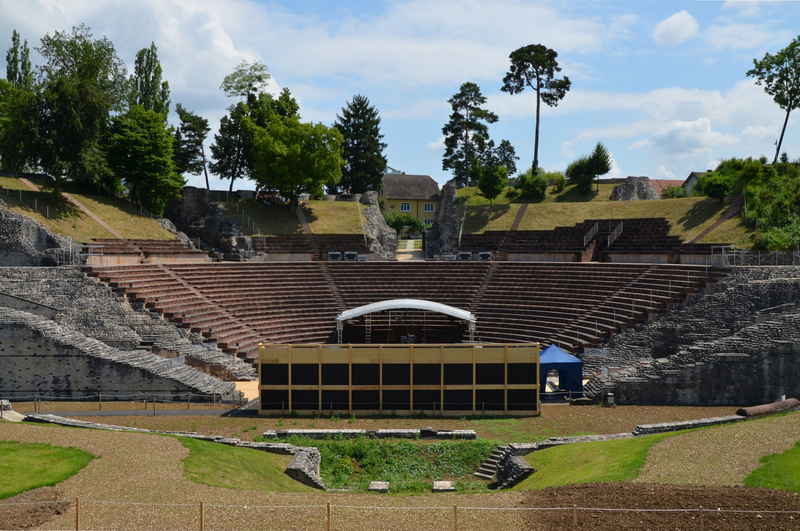 Today 2,000 visitors can be seated on the reconstructed seats. Next postDupondius commemorating Hadrian’s arrival in Rome on July 9, 118 A.D.